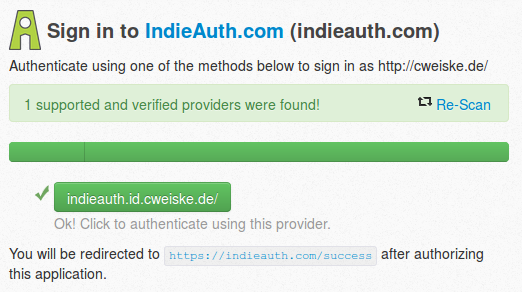 indieauth.com, the service that is used by the IndieWebCamp Wiki to authenticate users, finally got support for federated logins. To be able to log into the IndieWebCamp wiki, one had to link to and use third-party services like Github, Google or Twitter. That's not indie. OpenID did that better from the start. Unfortunately, it did not work. Aaron beat me to it, and so I submitted patches which solved that issue as well as one that prevented redirect URL verification. Some minutes later the changes were rolled out to all the indieauth.com servers, and I can finally log into the IndieWebCamp wiki with my OpenID server. And remove all rel=me links from my homepage.